SPOKANE, Wash. — Natatorium Park, the Baker’s Beacon and The Spot were once the hot spots for finding a date in Spokane. All three are long gone, but some of the couples who were brought together at those iconic Spokane locations are still married. Now in their 70s and 80s, they struggle to remember those first dates details. But what they do remember are the locations which made their Spokane love stories unique. I sat down with six local couples who have been married for a combined 371 years. All six couples are part of an elite group in the U.S. It’s the small percentage of Americans who have made a marriage last for more than 50 years. According to census statistics, only six percent of married couples celebrate a golden anniversary. In honor of Valentine's Day, the couples have shared their Spokane love stories. For Noreen, it was love at first sight when she met Gary while walking up the Division Street Hill from the Baker’s Beacon. Shy Gary didn’t even know Noreen had claimed him at first. Both reminisced about the good old days of dating in Spokane when Hillyard Hijinks and Natatorium Park were the epicenter of their social lives. About a year later they were married. Gary served on the Spokane Fire Department and the couple had three kids. They retired and became snowbirds splitting their time between Spokane and Yuma, Arizona. When Jim and Sherry met in the early 1960s, two love affairs began — one between them and one with the Cathay Inn. The two met at a party in Spokane and Jim took Sherry to the Cathay Inn on Division. It would become their go-to spot. Jim fell immediately in love. He knew he’d marry Sherry by their third date. He even told her so. Their good life included working on the Spokane Fire Department, four kids and golfing. They retired and split their time between Spokane and Thousand Palms, California until Sherry’s death. She died in 2017 with Jim holding her hand. She was 73. “It was the worst thing,” Jim admitted as he went on to explain that he still has a hard time without Sherry. On a positive note, Jim recently welcome his first great-grandchild and is busy proudly showing off her photos. Logan Elementary in North Spokane served as the backdrop for Howard and Mickey’s love story. The two met in 1948 when Mickey's family returned to Spokane after World War II. Two years later they began dating. “When we started going together in high school she was going with another guy and she broke up with him to come with me,” explained Howard. They spent the remainder of high school attending dances at The Spot in Downtown Spokane and hanging out at Natatorium Park. After high school, Mickey and Howard married. However, you won’t find the church anywhere in Spokane these days. It was torn down to make way for Interstate 90. Howard worked as a firefighter in Spokane while Mickey raised their four kids. They’re grateful for their large family which now includes 13 great-grandkids. The couple retired and split their time between Spokane and Thousand Palms, California. Now Howard and Mickey are living full-time in Spokane surrounded by their friends and family. Looking back, they both agree that dating was easier in their day. Junior high school love was the real deal for Robert and Bonnie. They met as kids in Minnesota. Robert fell in love with her quiet sense of humor. They married in January 1947 in what Robert described as the coldest spot in the country. Not long after being married, they loaded up their 1939 Chevrolet and moved to Spokane with two kids and a third on the way. Bob and Bonnie would go on to have five kids. He eventually retired as a fire captain for the City of Spokane. Bob choked up while trying to describe the woman he lived with for 62 years. That is because Bonnie has been gone ten years now. She died at the age of 81. When asked what he missed the most about his wife. “I was home on leave from the Navy and a good friend of mine wanted to meet this gal,” explained Mike. Lucky for Mike, that girl brought along her friend. It was a blind, double-date that led to a St. Aloysius wedding more than four years later. Mike eventually left the Navy and went to work on the Spokane Fire Department. Linda raised their two kids and the couple split their time between Spokane and Priest Lake. An airman picked the cutest nurse at a military dance and the rest is history for Donald and his wife Muriel. The couple didn’t meet in Spokane. But the military brought them to Fairchild Air Force Base in the 1960s for three years. They would return to Spokane to raise their family in 1972. Donald and Muriel met at Mitchel Air Force Base in New York. Muriel lived in the nursing dormitory and attended a dance at the air field. Donald spotted her and never let her go. However, he wasn’t always prompt about getting her home before curfew. Watch their video to find out the unusual place Donald and Muriel would kiss goodnight when she was forced to sneak into the dorm. 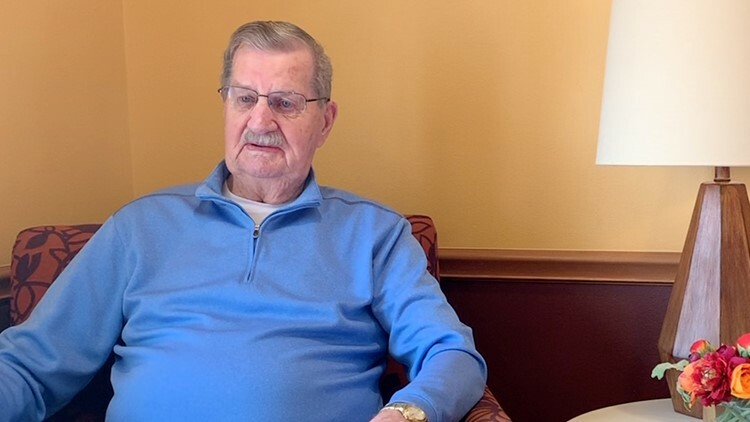 Now 98 years old, Donald called coming home from the Vietnam War one of the hardest parts of his marriage. He said the separation was difficult but regaining control over three teenage kids when he returned home took nearly a year.